Codebreakers Collection (formerly Big Value Codebreakers) is packed with over 70 challenging coded crosswords, with the added advantage of being in large clear type. These easy-to-read puzzles are just as entertaining as those in its sister title Codebreakers, but their clarity means puzzlers can concentrate on cracking those tricky codes. I have enjoyed doing the odd codebreaker in the past but now I&apos;m totally hooked! 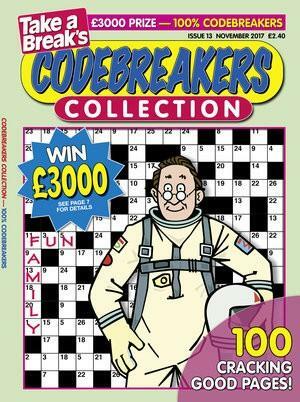 Take A Breaks Big Value Codebreakers contains over 70 codebreakers that are clear, easy to read and best page layout I have come across. This is published 14 times per year, please allow up to 6-8 weeks for your first delivery. Your subscription will begin with the next available issue.